From the age of 17 Jim has enjoyed working in the building trade and with 40 years experience in the business, he has worked his way up from a labourer to running his own thriving building company. But things started to go wrong in 2014 when Jim suffered a complete mental breakdown. Looking back, he believes this was due to a tragedy in the family. Jim was struggling with every day activities and says, “I would often leave for work but didn’t want to face anyone so I would sit in my van for hours not wanting to see or speak to people”. The situation came to a head when he finally admitted he needed help but by then he was in serious debt and owed so much money that he lost his business and family home he shared with his wife, Gail. In 2017, after a long battle with mental health and with the support of his family and counselling, Jim started to feel more positive about his future and was able to return to work in the building industry. However, in December of the same year Jim started to experience chest pains. A scan revealed a shadow on Jim’s lungs and a biopsy returned the devastating news that he had lung cancer. Yet another blow to a family that had already lost everything and were just about getting back on their feet. Jim added, “The doctors have been really good and when it was discovered that I had cancer I was given very fast treatment”. Jim was referred to us by Macmillan Cancer Support who understood Jim’s situation and knew the family needed financial support. Gail had recently recovered from corneal transplant surgery and had only just returned to work part time, but because of this they were not entitled to any benefits. The bills were mounting up again and they were receiving final demands not knowing how they were going to be able to pay them. Jim and Gail said, “We can’t tell you what a relief it is to be able to pay the outstanding bills and what a difference the Lighthouse Club Charity’s financial support is making to our everyday living. Knowing that we will not need to worry so much about being able to pay our bills is a massive weight off our minds. This has come as a huge positive for me in what has been a very difficult and negative time and I want the Lighthouse Club Charity to know that we are so very grateful of the help that has come from fellow workers in the construction industry. Without their support I don’t know what we would have done”. 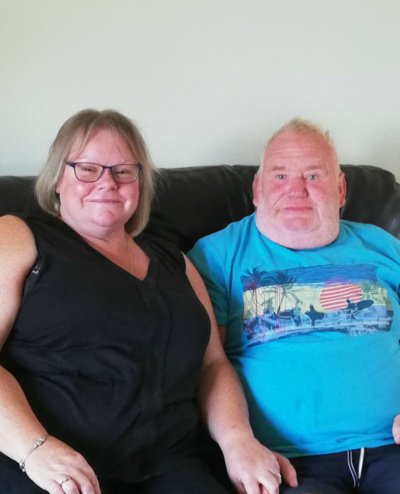 Jim is yet to find out how successful his radiotherapy treatment has been as he is due to have a scan at the end of June, but the Lighthouse Club Charity want to wish Jim and Gail all very best for the future and we are all keeping our fingers crossed for positive news. If you’d like to know more about how you can support our work and help people like Jim, visit our Support Us page.